With support provided by the Katz Family Women, Ethics and Leadership Fund, the Kenan Institute for Ethics, the Duke’s Center for Latin American and Caribbean Studies, the Global Health Institute, and Artist Studio Project will host Dr. Libia Posada Aug. 31 to Sept. 16. 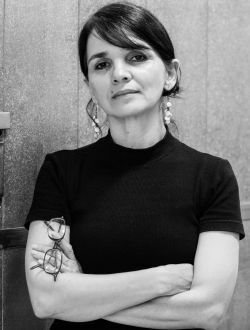 Posada, a Katz Family Fellow, will spend her time on campus and in Durham leading workshops and presentations with students, faculty and community members that deal with migration and trauma and how she connects art and medicine. Posada will also showcase an in-process art installation throughout her stay, “BE PATIENT | SE PACIENTE,” comprised of materials collected from Duke’s Medical Surplus Warehouse and Posada’s own work. The installation can be viewed from Sept. 5 through Sept. 20 at the Fredric Jameson Gallery in the Friedl Building on East Campus. Duke will host a reception to highlight Posada and her work at 6 p.m. Sept. 16, which is open to the community. Posada will collaborate with local non-profit El Centro Hispano, which advocates for equity and inclusion for Hispanics/Latinos in the Triangle. 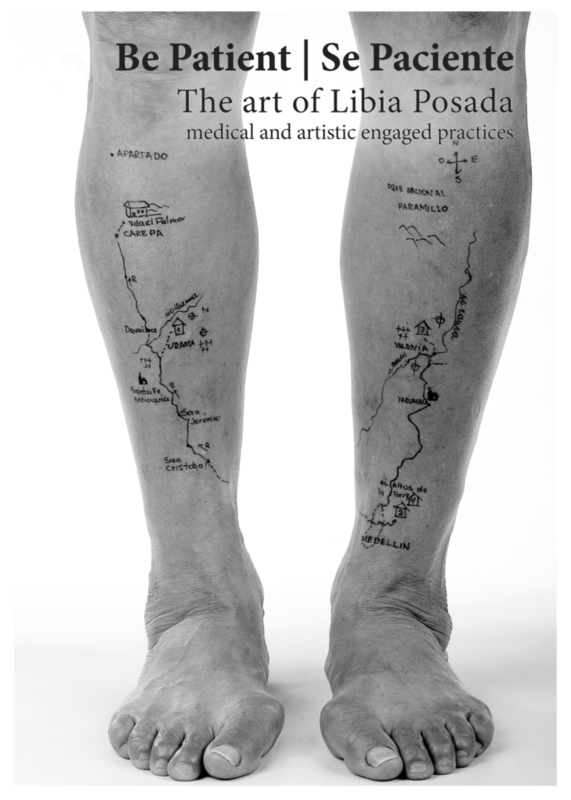 She will develop a focus-group workshop on migration, body and geography based on her 2008 artwork “Cardinal Signs (Body Maps),” which mapped the journey of forced displayed Colombians who fled war in their country with ink drawings on their legs. 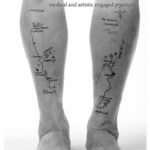 In Durham, Posada will work with a group of Central American migrants to share their stories of coming to the U.S. and detail the process physically by drawing on their bodies maps of their travel as a way to represent the physical toll of the experience. At Duke, Posada will visit classes to present on her work dealing with partner violence and sexual violence with students, faculty and staff at the Duke Women’s Center, the Global Health Institute, the and Social Practice Lab. Posada will lead short workshop discussions on the topics from a medical, cultural, and social perspective, noting the phenomenon of infectious disease, violence, and trauma. Participants will produce text and image-based art based on the discussions. 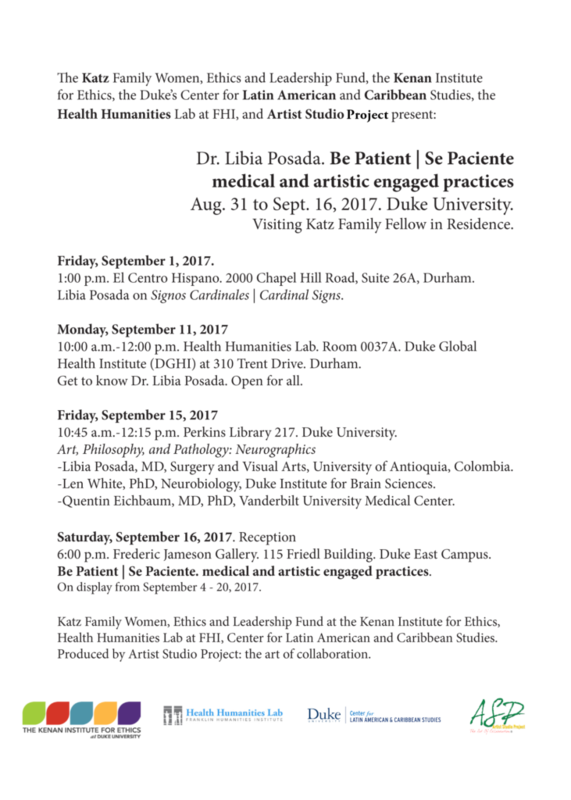 Posada will participate in the Franklin Humanities Institute’s Health Humanities Conference, “Breath, Body, Voice.” She will co-lead a workshop on her unique medical/artistic practice that links research, action, and creation with communities in Colombia and Durham. Her art exhibit and reception will be held 6:00 to 7:30 p.m. at the Fredric Jameson Gallery, 115 Friedl Building (Duke East Campus). Libia Posada, M.D., is a surgeon and contemporary artist from Medellín, Colombia. She specializes in emergency medicine, social medicine, and visual art at the University of Antioquia. Her overlapping medical/artistic practice focuses on public health, intimate partner violence, forced displacement, trauma, traditional medicine, and community healing practices. Since the early 1990s, Dr. Posada has worked for public hospitals and in private practice to care for patients suffering physical and psychological trauma from Colombia’s history of internal conflict, including violent crime, narcoterrorism, forced displacement, and epidemic gender violence. Her art, ranging from performance to installation, photography, drawing, and video, is collaborative and community-responsive. 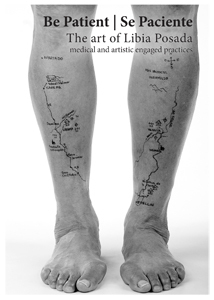 Her 2009-2011 “Cardinal Signs (Body Maps)” explores embodied storytelling of forced migration through focus group work and temporary body tattoos. In 2012, “Neurographics and Grey Matter: The Inefficacy of Reason” conducted workshops with victims of forced displacement and the visual medium of diagnostic MRI images to produce testimonial visual installations. Her current work is engaged with botanical knowledge and alternative healing practices, including nutrition, sustainable food practices, and community memory of health traditions. Dr. Posada has exhibited in Colombia, Mexico, the UK, Brazil, China, Switzerland, Cuba, and Chile. Posada’s Signos Cardinales | Cardinal Signs (bodily maps) will be replicated via workshops and photography with migrant communities during her time in Durham. Dr. Posada’s artistic residence at Duke University is sponsored by the the Katz Family Women, Ethics and Leadership Fund at the Kenan Institute for Ethics and organized by Kearsley Stewart of the Duke Global Health Institute, and Miguel Rojas Sotelo, of Duke’s Center for Latin American and Caribbean Studies. Produced by: Artist Studio Project: The art of collaboration.